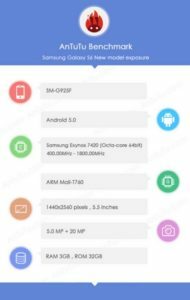 The turn of Galaxy S5 has not finished yet and we are getting plenty of rumours about Samsung’s next flagship device Galaxy S6. The phone will be coming in different variant and code name for different retailers and networks. SM-G925F is the European model of the upcoming Samsung smartphone. One of the S6 will come with a curved edge display like the Note Edge, SamMobile reported. And mostly carrying some of the unique features from S5. The phone is yet to release early next year as all the news and rumour suggests. The Galaxy S6 will have a Quad HD (QHD) 2560 x 1440 pixel resolution display. You will get the latest Corning Gorilla Glass 4. There might be a 20 MP camera at the back with phase detection, autofocus, HDR and 4K video recording. And a 5 MP front facing camera. The phone will be running Android 5.0 Lollipop. Powered by Samsung Exynos 7420 64-bit processor and Snapdragon 810, & ARM Mali-T760 GPU. S6 bearing an internal memory capacity of 32 GB to start with. We are also expecting a 64 GB and a 128 GB version. 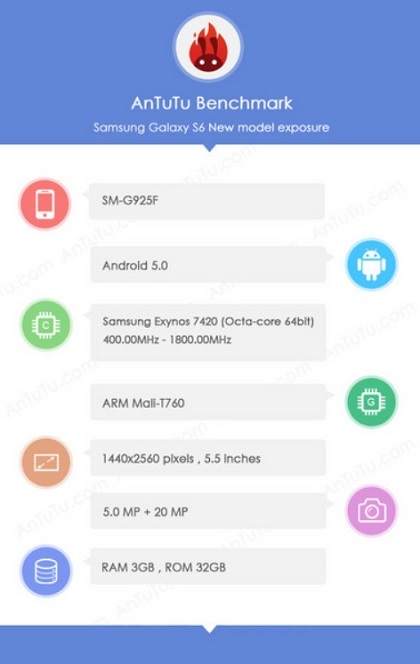 From the leaked Galaxy S6 AnTuTu benchmark result we can see Samsung increasing the to 3 GB, where S5 released with 2 GB. The Galaxy S6 coming with PayPal certified Fingerprint sensor, Heart Rate Monitor (HRM) and it is IP67 certified. Meaning water and dust resistant. Another amazing upgrade coming with this high-end specd phone is LTE Cat6. This has a benefit of double download speed @ 300 Mbps. Still we have no confirmed specs nor Samsung made anything official. There is no news about the battery capacity yet. And, 4 GB RAM would make it more appealing. Samsung is busy at the moment to release the Note Edge within the next few days. We may get some more information about the Samsung Galaxy S6 soon.